A new patient Michael presented with pain around the ball of his foot several days ago from playing tennis. There was no changes in his activity, only a change to the newer model of his current Tennis shoes. 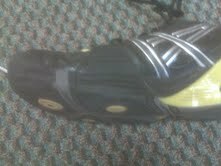 Before I show you the shoes, please look at this video on the Shoe Flexion Test. 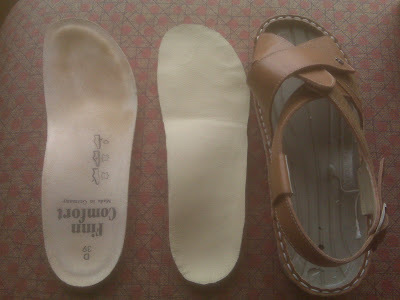 Here is the bottom of the right old and newest version of the same shoe. The older version with the grey bottom bends very easily across the ball of the foot. The newest version of the same shoe allows no bend at all at the ball of the foot. The yellow circle is where the bend should be. 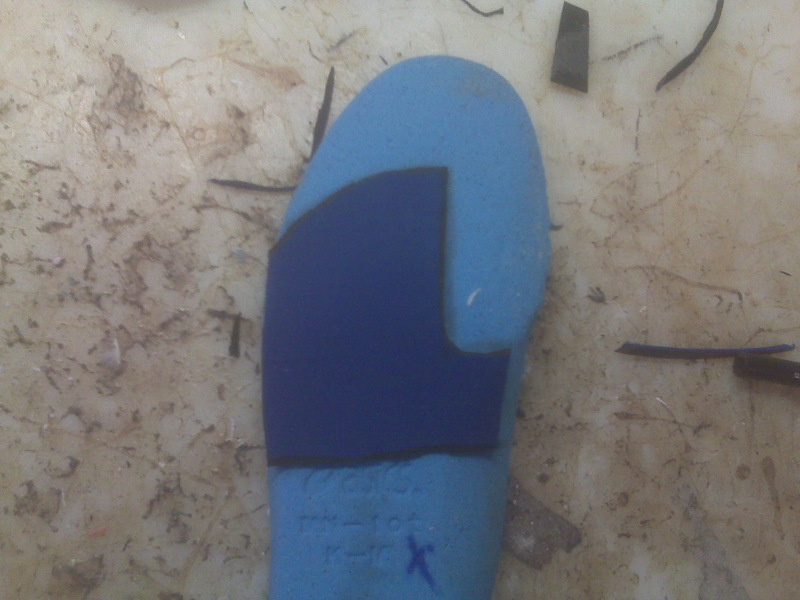 The bend is placed into the shoe before and after the appropriate spot to bend. The yellow dot was placed for pivoting, but does not allow for normal bend. 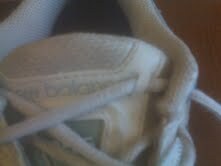 By doing the Shoe Flexion Test in the shoe, this shoe should never have been purchased. The side view of the yellow dot area shows the relationship of the dot to the ball of the foot where the shoe should bend. The grooves are too far towards the toes or towards the arch. This will force the foot the foot to bend in the wrong place possibly causing injuries. There are many shoes now out on the market that bend too much, too little, in the wrong place for the foot, or a combination of factors. Buyers beware!! Over the next few days I will try to give more thought and recommendations in the Barefoot Running Controversy. A nice patient today brought to my attention that Google has a way to easily keep track of your health online, and share with others as you see fit. We all have to get better with this (or at least most of us). Please follow the email and give it a look over. Really a pleasure to meet you. Here's the info on Google Health, though I haven't gone very far in exploring it. You can find it in your Gmail account by going to "more" at the top of your gmail page ( right after Reader Web); then click on "even more" and you will see it on the left hand column of Google sites as Google Health; or just try this link. I forgot to ask any specific shoes you might recommend as I try to build back to walking and running? I've been using neutral shoes because of the orthotics. Here the left big toe is clearly longer. This is called the Egyptian Foot in Ballet and leads to too much pressure in the big toe joint over time. If you imagine a dancer on pointe with this long first toe trying to balance and finding it very difficult. This foot type occurs in about 10% of the population. See the long second toe in this patient. Here is an xray of the most common foot, the Grecian Foot, with the long 2nd toe and 2nd metatarsal. The measurement taken means nothing, but the line straight across from the 2nd joint shows the typical 3 or 4 mm shorter length of the big toe. This is actually crucial in gait during propulsion, or AKA push off, to have the big toe shorter than the second so it can plantarflex or drive into the ground to lift up to 10 times body weight. This Grecian Foot occurs in 70% of the population. Another example of the Grecian Foot with the long second toe and metatarsal. This also is not perfect for ballet since the ground reactive forces pushing back on the second toe causes it to eventually buckle and cause a hammertoe. Here is my case study of Paige. Paige has the Egyptian Foot. 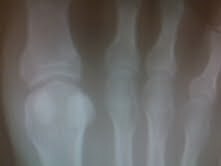 She presented to my office with severe pain around the big toe joint and I feared she broke something, especially the sesamoids. She how long the first metatarsal is. In propulsion, the first metatarsal has a harder time plantarflexing (pushing down into the ground for pushoff) because it is already jammed into the ground before pushoff begins. Again, Paige's numbers mean nothing, but you can see that in relationship with the 2nd metatarsal, the first metatarsal is not 3 mm shorter, but actually 4 mm longer. This is a 1/4 inch too long. Paige will have to use some form of Dancer's Pads for activity forever to balance these forces. Here is the happy news I gave Paige yesterday. 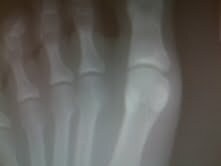 She had not broken her sesamoid, the sesamoid is seen under the first metatarsal. The MRI showed how inflammed the joint was, but the bones were doing well. She is taping the joint, icing, contrast bathing, dancer padding, and eventually I will design some orthotics to off weight the area more custom made. This is close to the final type foot, The Peasant Foot. It is where the first and 2nd toes are the same length. It is the ideal foot for ballet in this regards (there are other foot properties that make a foot good or bad for ballet). Even pressure is exerted at pushoff through both these key metatarsals and toes. I have not done enough research to know if it also gives an advantage to walkers and runners like th Grecian Foot does. Sorry Paige, but with alittle padding you can have the same function and comfort as the Greeks do. This was a wonderful email from my patient Kate. The Merrell Barefoot Collection could prove to be the barefoot shoe that podiatrists and barefoot enthusiasts both like ---image that!!! Probably can put an orthotic temporarily in that if symptoms occur. Thank you again for fixing my toe. I can't tell you how much better I feel. You were also the most personable doctor I've ever met in a doctors' office, so thanks for that too. Here are also more information seen on the Merrell website. Go easy, be smart, be safe, but be barefooting!! The high heel shoe is often verbally chastised for some of the problems it can cause. That being said I think it is important to understand its importance in our fashion industry and to analyze some of the components of a stable high heel shoe. Next time you are in the market for this shoe type consider this list of properties that may make your selection a little safer. 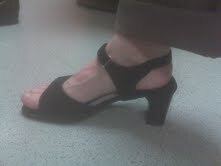 Here is one of patients demonstrating a wonderful Beautifeel Shoe that really was stable. 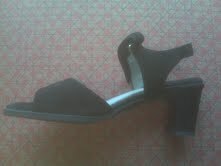 Even though not this year's model, here is a link to their line where you will find several shoes of similar qualities. You can use the criteria below to find shoes made by many companies. 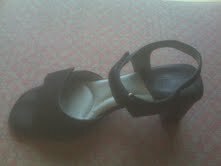 The heel area should be wide (Cuban style). When landing on the shoe, the heel should engage only momentarily, with the weight transferring quickly to the arch and the front of the foot. You should not feel a jarring sensation when landing on the heel. The video above is about optimism and alot more. It is about finding out who we are as athletes and as individuals. It is about cross-training when you are injured and can not do our sport. It is about accepting who we are at any given moment and looking for answers in a positive light. It is about the glass half full. It is about realizing the journey is more important than the end result. It is about joy. As a kid, I would listen to the San Francisco Giants games on the radio. When the Giants came up, I would bat for them. When the Giants pitcher was on the mound, I would pitch for them. There was such joy in this journey. My childhood is filled with great victories of this sort. They are very happy memories. I would dream one day of playing for the Giants. The practice of medicine should be like this, celebrating all the victories, staying optimistic in the defeats. Finding hope in everything should be the goal. If strike 3 is called, the fun should only be beginning. I don't believe in strike 3 in medicine, the patient should get to hit like in T-Ball until they put the ball in play. I doubt major league baseball will go for that, but doctors/therapists/patients should. Give up after 3 failures at something. Nonsense. I went to a great talk yesterday from Dr Karen Langone, sports podiatrist, from Long Island, New York. Dr Langone is the President of the American Academy of Podiatric Sports Medicine. See their website at http://www.aapsm.org/ She was a great proponent for the Wii System by Nintendo with Balance Board as a way of Lower Extremity Rehabilitation. I am attaching a couple of links for you and will be investigating this further. It is amazing what we think we hear. It is amazing what patients can tell us if we listen to them, and that normally takes some time. Patients should always ask: Are my health care providers listening to what I are saying? It requires time, and a desire to listen, even when you think you already know the answer. For, when you listen, you will hear more richness than mere answers to questions. I work in a clinic, and a very nice one at that. My wife and I have long decided that this is the best place for me until I retire. I am very slow and do not care much for the details. Being an independent contractor, I can see one to 4 patients per hour (my choice). What pays more? Your guess will probably be right, but I tend to chose the one patient. The world says that this is sad. Reality of bill paying says that this is sad. Many times I doubt my dedication to my family. I should be bringing home more income. But, I have never ever doubted my dedication to my patients. And I give them the time they need, or I need, or we both need. But, time is all we got to give another human being. In that time, things can happen. Wonderful things. I saw a patient Erica today. Probably spent over 1 hour with her. She had seen 2 other practitioners before me who missed the diagnosis of her broken heel bone. It was a quite obvious diagnosis. Why did they miss it? I bet time restraints. Too much on their plates. I was not smart, no need to brag, needed an MRI for the diagnosis. It all just took time. Probably my lack of desire to be a good provider for my family actually helped me be a good doctor to Erica. The world tells me this is sad, but my heart is happy. I helped Erica today, and Joseph, and Cheryl, and several others. This is why I told myself in high school I wanted to be a doctor. I wanted to help others. And it starts with Listening. This email was just received on 4/13/11 regarding a sesamoid injury that may be healed, we hope?!? Here is the original blog post when Kathy consulted me. Just home from another visit to my podiatrist. 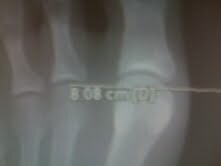 Last X-ray was January 5. It revealed some very good progress as mentioned in my February email below. 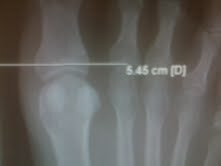 Today, however, the X-ray they took didn't reveal nearly the "closure" of the fracture that the January image did. He told me right off that of course the angle of my foot this time may have been slightly different when they took the X-ray but it did appear that it could be a little worse. Ugh. 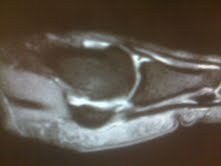 BTW not sure I ever mentioned but this is a tibular sesamoid fracture (is that right?). It's the one nearest to my second toe over. So here's the deal. I'm one of those people who will take pretty great care in healing but THEN when all seems pretty well (if physical activity is involved that is) then off I go usually pushing myself a bit too hard. My foot doesn't necessarily feel worse today then it did in January BUT I have done little to care for it since then other then still bearing some of my weight to my outer foot edge, only wearing stiff souled Ugg sheep lined moccasin style slippers when in the house as opposed to barefoot, and not trying anything like downward dogs in yoga or hard right angle bend type movements sports or walking wise to the toe. Overall my flexion up and down of the toe has seemed to continue to heal but I have a severe addiction to beach walks! My usual for the last 10 years prior to injury was 3 miles per day. All but a few walks only since the injury was all I took to help with the healing UNTIL Januaryish when cast came off and by mid to late February of this year began 3 to 5 mile walks as I could handle them. First once or twice a week but then several times a week. No real pain has ever ensued and I aim to walk carefully but have had days where the sesamoid definitely talks to me a little during walk (with little twinges here or there) or afterward when I return home (a few subtle aches...but still very sporadic). All the time when walking whether fitness or otherwise I try to correct my foot by not turning it in, not walking so much on outer edge, and relaxing my toes upon each step (so as not to push off too severely ever). So I'm not icing, taping, taking calcium (but do eat VERY healthy and probably do okay with the cheese/greens I consume) and overall yeah...maybe not doing the best job with things. Today podiatrist will try to get me a both growth stimulator but not sure my insurance will allow the 3500k deal so could be on my own as far as that goes. So some questions if you can spare the time. Do you feel like this injury will see results from the stimulator? Do I need to just get back on the regimens of ice, taping, rest, and easing up? Is perhaps the subtle amount of pain actually the "good" pain? I mean it's never agonizing. At one point my toe got sort of folded over once when I was in bed, about mid Feb I think. It created a bit of a tender pain but no pop and no residual pain after. Scared me a little but seemed okay. I imagine that could've opened the fracture up a bit but if I had a true re-injury wouldn't it go back to that hideous pain I had at the start? Should I just give up and have the thing removed or is this ALL just a game of patience and 6 more months if I'm careful the thing might actually be good? Sorry to be so long winded. Your email to me was SO helpful and such a relief and today I just feel totally deflated after 6 months of restraining from all the things I love. I know of course things can always be worse but nonetheless a tough road this has been. Would love to hear any insight you may have and truly appreciate your time. Your blog is helping so many people know about one of the least understood injuries out there. I find most patients over restrict themselves during these 2nd 6 monthes of the typical 1 year rehab from a sesamoid fracture. This is totally fine since you must listen to your body and trust it. These next 6 monthes need to be a gradual increase in function, even if you get some symptoms, and you will. On a pain scale of 0-10, you should keep the pain down to 2 or 3 max. Sounds like you understand Good vs Bad Pain, but do not really believe the principle. Believe it and own it, and you will rehab better. Your symptoms will give us more info than any doctor, or xray, or any MRI. I hope that you have inserts that protect the sesamoid. I hope you will start the Walk/Run Program as outlined in a different post. 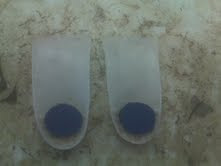 I hope you will ice 3 times a day for 10 minutes to control the symptoms related to inflammation. This may dramatically change your symptoms. I love the walk/run, because once you are running 30 minutes straight, you are at a different point in your injury, and decisions can even be more solid. Dorsiflex the First Metatarsal causing Apropulsive Gait (not allow normal first metatarsal plantarflexion. Dorsiflex the First Metatarsal producing Lateral Instability with compensation. "25 Common Shoe/Insert Modifications in a Podiatry Practice"
Left Outersole Lift for short leg tapered to the toes and cuts for flexibility. 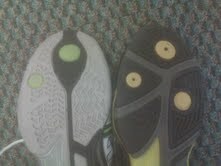 Sole or Your Sole inserts are much better than Superfeet for adjustments. This is the soft athletic red version. Blue version is much thicker, and grey version for dress shoes too wimpy. For simple mechanical changes, or for biomechanical experimentation, these work great. 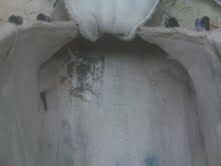 After the midsole is cut with a 10 blade about 1/3 way in, Barge cement is used to glue. 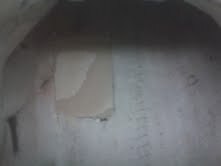 1/8 to 1/4 inch grinding rubber is skived and then glued on both sides. 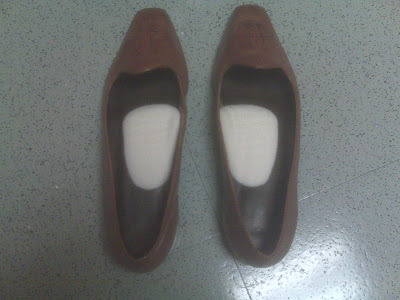 After 5 minutes, the glue is dry enough to place into the shoe. 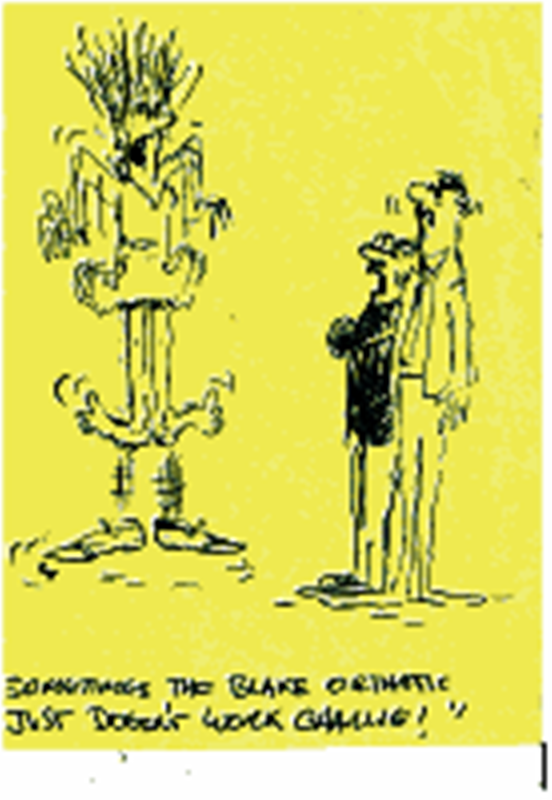 Superglue is used to seal any looseness. 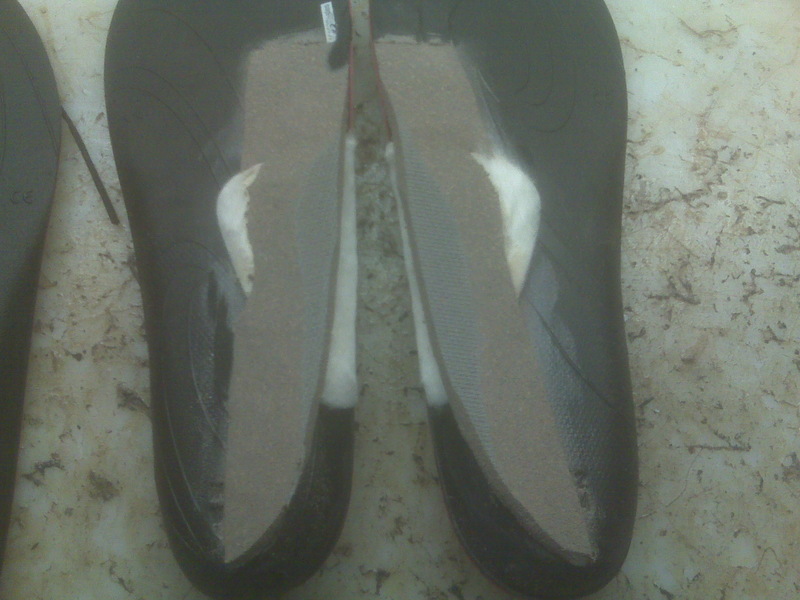 Here a 1/4 valgus wedge for supinators is being demonstrated in the lateral heel and midsole area of a left shoe. 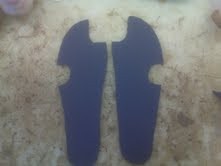 Custom Inserts can now be made for alot of sandals with the explosion of ones with removable inserts. 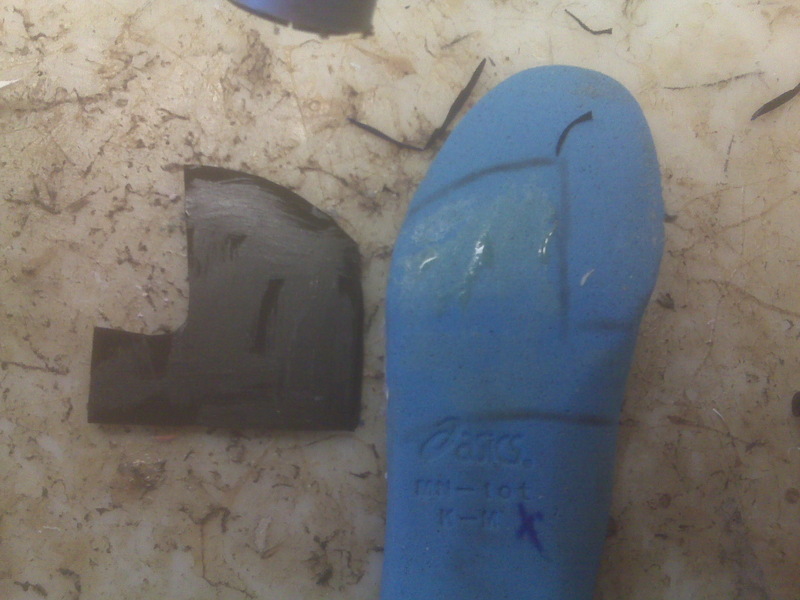 Sole insert with added medial arch with Hapad and additional 1/4 inch varus wedge with grinding runner. If you are unsure if the pronation you see in gait is causing the symptoms in the patient's knee, hip, shin, or back, experiment with Sole and get their response before designed an appropriate custom orthotic device. 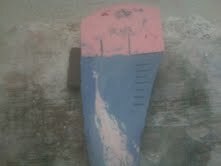 Bottom view of the Hapad arch and 1/4 inch varus wedge. The famous Blue Dot of 1/8th inch Poron or spenco (less easy to skive the edges) to give added cushion to any sore spot that bears weight. I love Hapads. Began using them in Ballet slippers and Pointe Shoes and the rest is history. 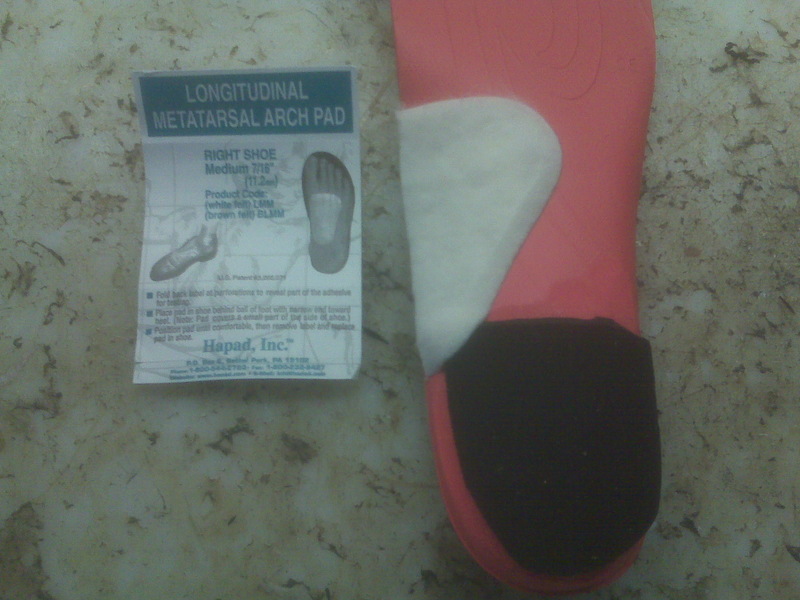 Get a supply of small and extra-small Longitudinal Metatarsal Arch Pads. Easy to thin out when too thick. 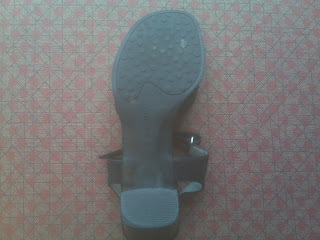 When I use these Hapads in shoes directly, always use the right in the left shoe and vice versa. Tends to work better with the shape of the curve in the arch area of the shoe. 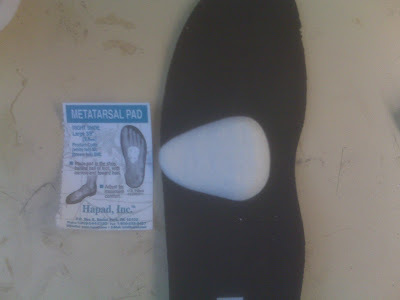 Also love Hapad Metatarsal pads. Never put under a sore spot, always behind. See the diagram shows it one way and I demonstrate another. Experiment and think outside the box always. Patients should feel whether the pad is in the right spot or not, and should feel free to move around and thin. Get a box of small Metatarsal Pads to start. Lace Skipping is a simple experiment to discern if bunion or pain at the top of the foot may be coming from tight laces. Here bunion pain with this hiking boot is greatly reduced with simple lace modification. See how you normally do not have to skip the entire front area, so there is less loss of stability. When using lifts for short legs, I prefer the added stability of full length (or sulcus length) lifts. This photo just put on emphasis on the flexibility cuts in full length lifts. 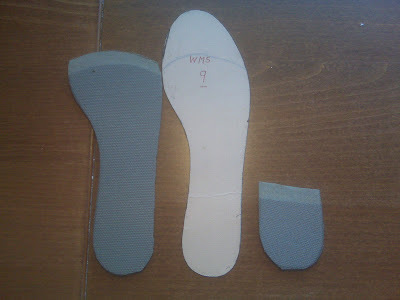 Dancer's Pads are made to help protect and off weight the big toe joint (including the sesamoids). It can be multi-layers, but care should be taken to discuss with the patient if they feel the pads off weight the sore area or toss them into the hole. When you are experimenting with patients and making changes in their biomechanics, it is a good idea too remember to have some humor, and remember if you make any mistakes, I have made them 100 fold before you. 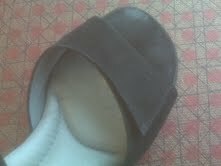 Remember spenco as topcovers and forefoot extensions ---very durable and the best cushion out there. Even with rearfoot posts, consider a softer product if you use plastic. This is birkocork which holds its shape well and much kinder on knees and hips than plastic posts. Here is an example of a heel lift applied directly to an orthotic for a short leg. I would recommend keeping them separate and going full length with the lifts. Here is a combination of Budin Splint for Hammertoe and metatarsal pad. Remember that you can combine anything. 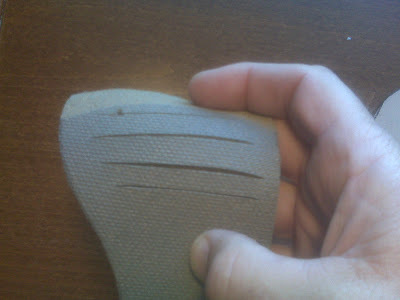 Severe heel pain, think 1/8 tto 1/4 inch adhesive backed gel padding before you put on the topcover. In these cases, if the orthotic device is plastic, ask the lab to thin the plastic as thin as possible before the rearfoot post is applied. Here a patient with chronic pain under the big toe joint is having the shoe modified. 1/4 inch hard shoe material will be replaced with 1/4 to 3/8 inch soft material. Very soft material, like memory foam, is used to fill in the hole. Normally, you have to use more thickness of soft material since it will compress more than the original material. Frontal plane instability (excessive pronation and/or supination) can be addressed with medial and lateral buttressing with 1/8 to 1/4 inch grinding rubber. Greatly improves overall feelings of stability on any insole. It can be appropriately skived to minimize the heel lift effect. 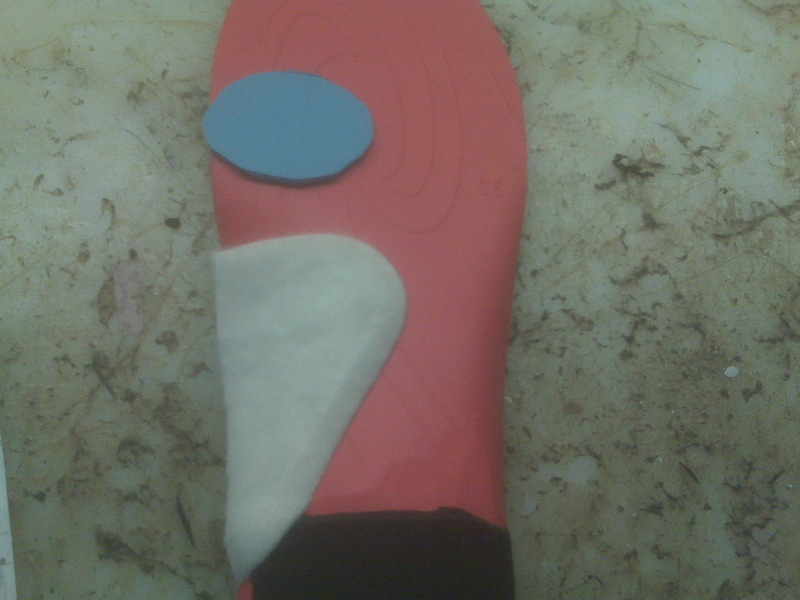 1/8 to 1/4 inch plastazote actng as memory foam ia a great material for padding when you want the foam to mold to the foot. 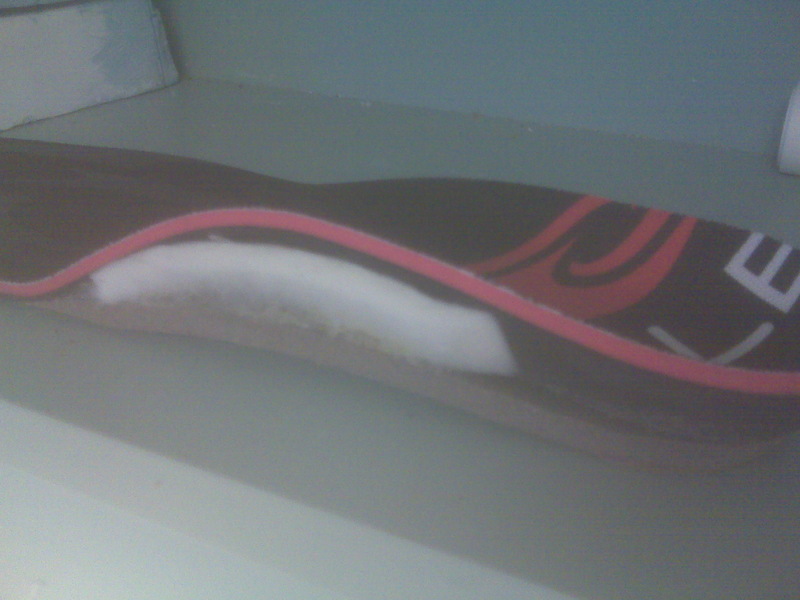 Here it is used as forefoot padding. Here a scalpel is used to create a loop on the tongue of the shoe to help keep the tongue from sliding. 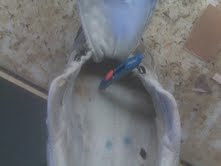 The famous Blue Dot used for extra heel cushioning in plantar fasciitis. Here a scalpel surgically increases the flexibility of the metatarsals. 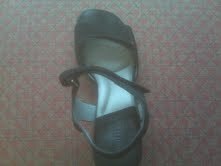 It is importantt not to cut all the way through to the bottom of the shoe or to the sides of the shoe. Normally, 4 or 5 cuts are made 1/8 inch apart. Varus or valgus outersole wedges to control pronation or supination forces are commonly used in harder to control shoes like dress shoes or sandals. Shoe Repair Stores are experts in making it cosmetically pleasing. Skip Laces to avoid pressure in sore areas. This is normally alright in a walker, but too unstable for running or hiking on uneven ground. Here a cut is made 1 to 1and 1/2 inch deep to place a 1/16 th inch of plastic for Hallux Rigidus. Tongue Pads can add stability to a shoe and can also accommodate a sore area on the top of the foot. 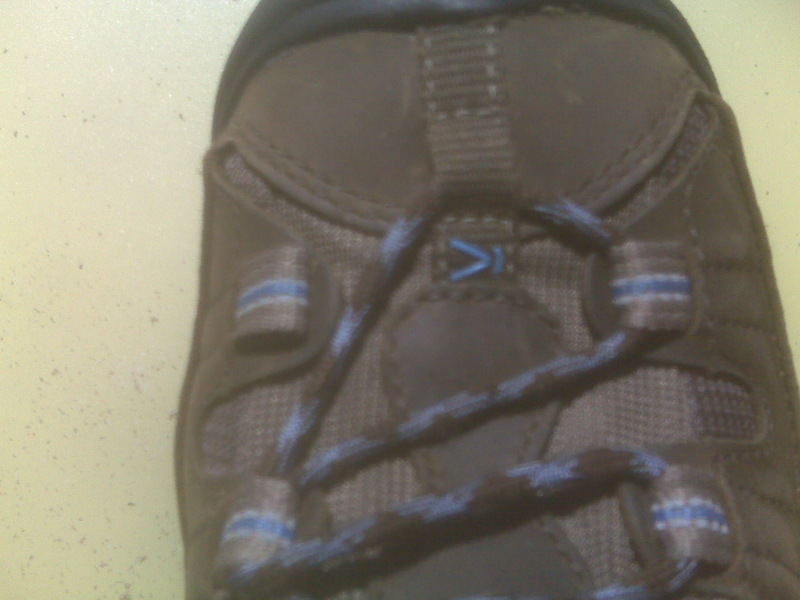 This function of accommodation made be combined with appropriate lace skipping.